I don't know how it happened. How a single, slightly wilted, green cabbage leaf ended up in a field of pine trees. (They weren't pine trees! Joe's voice rings inside my head. Fine. Fir trees.) But there it was, on the ground, just as I was looking for something to mark the tree we thought we might cut down, drag into our home, and decorate for Christmas. We needed an obvious marker, something we could easily find among dozens of nearly identical pines/firs. A cabbage leaf was just the thing. We weren't quite sure--the tree had a couple of obvious gaps in its branches, and it was rather sparsely needled. You could see right to the center of it, see almost the whole trunk. But it was the right size, and there was just something about it that had us referring back to it as we continued looking at other conifers. "This one isn't quite as jolly as the one with the cabbage leaf." "I like this one, but I think I like the cabbage one better." We called him Cabbage as the saw sliced through his trunk. 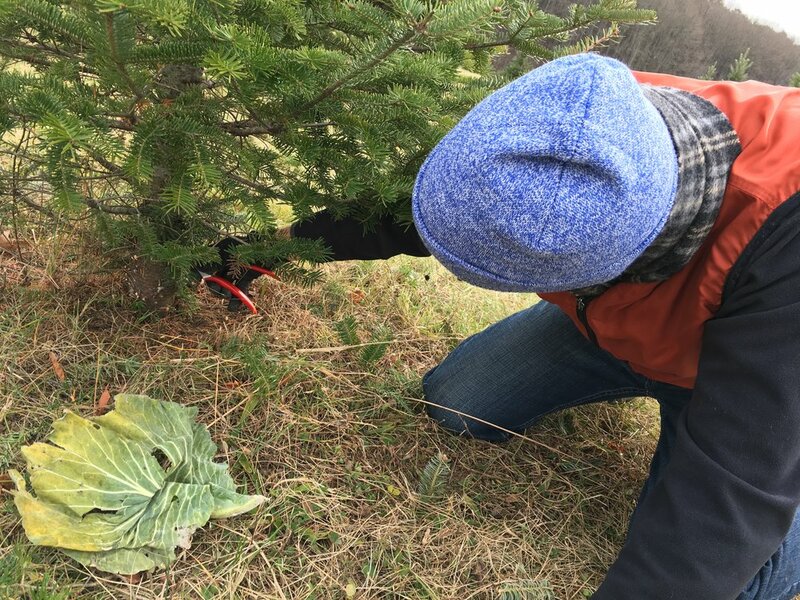 From there, I told Joe to be careful not to drag Cabbage along the ground, lest we bend his (yes, he's a boy tree) delicate limbs. As we entered our house, I said, "Welcome home, Cabbage!" As it turns out, his diminutive size and sparsely-needled branches worked perfectly in our house. We were able to bury lights and ornaments deep within, adding a depth and sparkle we haven't had before. Nice work, Cabbage! We greet him in the morning when we turn on the Christmas lights, and we say goodnight to him when we turn them off. We've tried our very best to give Cabbage a good home. It's the least we can do, considering we literally cut him down in his prime. But now, Cabbage is starting to move on. His needles are dropping. He's browning at the tips of his branches. He's not drinking as much water as he used to. He's becoming brittle. Very soon, we're going to have to say goodbye to Cabbage. But that doesn't mean we have to say goodbye to cabbage. We've had a bag of Brussels sprouts in our refrigerator for a couple of weeks. Tiny little compact cabbages. Fiber-filled parcels of cruciferous flavor. I don't know how they've lasted so long. Maybe they're holding out for Cabbage. Maybe there's a secret code that only cruciferous vegetables know, and they've been communicating between the living room and the refrigerator for days. Oh wait. Cabbage is a tree. Never mind then. Let's just make a salad. Shredded Brussels sprouts. Broccoli, chopped into bite-sized (dare I say tree-like?) pieces. Pomegranate seeds for tang, pop, and color. Sliced almonds for a little boost of protein. And a little cheese, because most things are better with cheese and this is one of them. Toss with some balsamic and olive oil. Or cider vinegar and olive oil. In this case, we had citrus-infused oil and vinegar our neighbor gave us. Crack a little salt and pepper and call it a meal. Farewell, Cabbage. We're so glad we got to spend some time with you. You've brought us happiness, good tidings, and a lovely forest-fresh scent. We'll miss you.